A pair of radar-equipped helium blimps tethered to the ground will give personnel the ability to see further away than with ground-based radar. Blimps are experiencing a bit of a renaissance. Recently Montabello, Calif.-based Aeros said it was working on a rigid airship that could fly like a plane and float like a balloon. 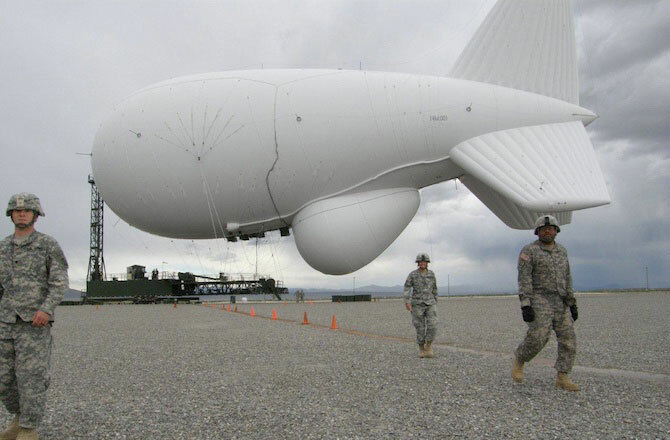 And now Raytheon has just finished testing a military aerostat of that, starting next year, will be a first line of defense for Washington, D.C.
It’s called JLENS, for Joint Land Attack Cruise Missile Defense Elevated Netted Sensor, and it’s a pair of radar-equipped helium blimps tethered to the ground that give personnel the ability to see further away than with ground-based radar. The two blimps work together with one using radar to “see” an enemy target and the other guiding a missile to destroy it. A microlight aircraft, powered by a Yamaha 150cc engine, spanning 17 ft long, with a wingspan of 24 ft, and weighing 100 kg, has been conceptualised by four enterprising students of HKBK College of Engineering. Appropriately christened — MAQH13, with the letters derived from the foursome creators — Mohammed Muzakir sharieff, Mohammed Quamer Tawheed, Mohammed Akhib and Mohammed Hussain, the aircraft has been developed at a cost of Rs 50,000 and will run on high octane fuel, with the propeller, that will pull the aircraft, measuring 52 inch diameter. The microlight, which is expected to take wing shortly, is awaiting the nod of the Directorate General of Civil Aviation (DGCA), according to Muzakkir Sharieff, one of the ideators of the prestigious final year engineering project. To motivate the visitors and inspire young minds, the students’ team is planning to gift the plane to Visvesvaraya Industrial and Technological Museum (VITM), Kasturba Road, after the completion of the project and its airworthiness is proved and necessary certificate received. The students were effusive in their praise for the support and guidance from Dr J Fazlur Rahman (IIT, Madras) and Principal, HKBK College of Engineering, Dr T C Manjunath, which helped them realise their dream. via Students give wing to microlight aircraft. 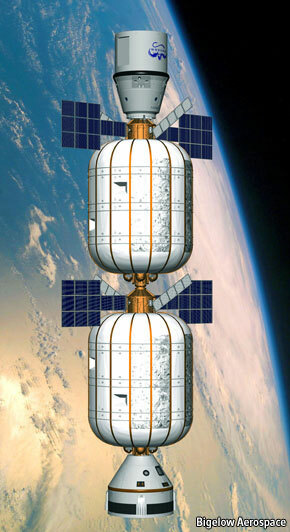 Inflatable spacecraft: Blown up in orbit | The Economist.